Relying on mailing yourself documents (“poor man’s copyright”) and automatic protections, is not the best way to protect your copyrights. The most reliable way to publicly establish your rights on record is still to register your copyright formally. That depends on the work and the level of protection you want to have if someone uses your work without proper authorization to do so. If you are not sure, it is best to consult with an attorney who specializes in digital rights and/or intellectual property rights (which includes patents, trademarks, service marks, and copyrights). Some things simply are not worth going through the formal process of registering for copyrights individually (i.e., pages on your website are not worth registering individually), but may be able to be registered as a collection of works. Imagine how expensive and time consuming it would be if the government required that every web page and newspaper article or magazine spread ever written had to be formally registered to protect copyrights! It would create an impossible situation for both authors, and the copyright office would be so bogged down they would not be able to keep up with all the registration applications. However, costs only run about $35–45 to register a copyright in the United States and registering important works could save you thousands of dollars in legal costs; even giving you more legal remedies if you need to sue for infringement on your rights. Numerous advantages exist for registering a copyright on something that is really important to you, and almost all major corporations routinely register their copyrights to anything that is available to the public eye. If someone attempts to sue you, trying to make a claim against your unregistered copyrights, it may be harder to assert your rights in court. Sometimes plagiarism is obvious, but it is up to individual courts to determine who came up with something first. Since anyone can simply date a document and slap on a copyright symbol (©), you never know how a court will rule. A Certificate of Registration that is issued within five (5) years of the creation date serves as prima facie evidence (authentic proof) that the work is original, and is owned by the registrant of the copyrighted work. With a registration, a copyright holder can get a temporary injunction against someone who might be infringing on their work. Most infringement violations are settled out of court. Having a registered copyright allows the copyright holder to send a “cease and desist” letter that can include the real threat of further legal action should the infringer fail or refuse to comply. In the U.S. you cannot even bring an infringement lawsuit against someone unless you have first registered your copyright. In some cases, you can always register a copyright and then file a lawsuit; however, to request expedited handling will cost hundreds of extra dollars. Perhaps one of the most compelling reasons for registering a copyright as soon as possible is the level of protection timely registration affords. If you register your copyright within three months of its creation, and you file and win an infringement lawsuit, you can be awarded more money. 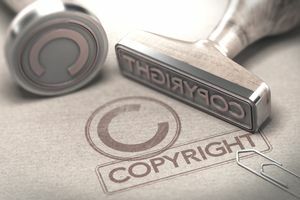 If you register a copyright later than three months after its creation date, you may forfeit your rights to receive statutory damages, as well as legal costs and attorneys’ fees.